It was a chilly one this morning. The weather is just crazy for this late in May and we have benefitted greatly. It was just below 40 as we started hiking and stayed cool most of the day hitting the low 60s at its highest. We had a big day ahead of us and the forecast was 50% chance of showers and thunderstorms in the afternoon. 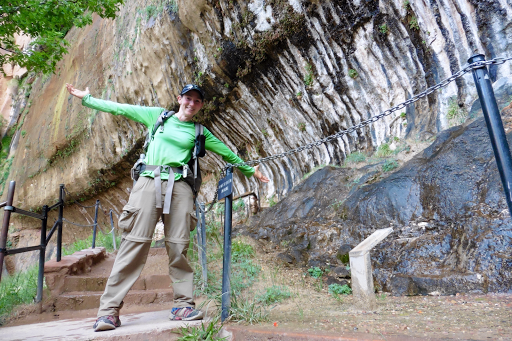 We had a nice and relaxed 3mi hike down to the official end of the Hayduke at Weeping Rock. It was a very pleasant end to the trail. 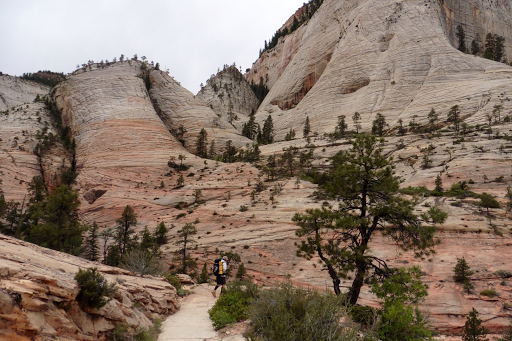 We were up and out at 6:45am, so we had Zion all to ourselves until we hit the final switchbacks going down. 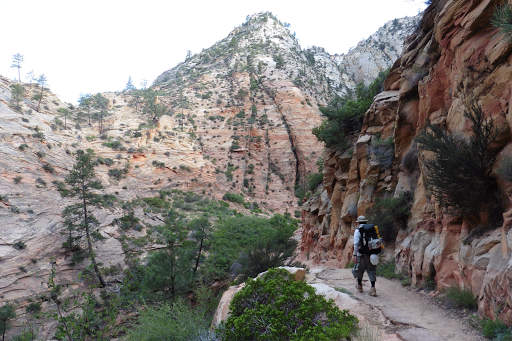 I’m a fan of Zion and it may be my personal favorite out of all the National Parks the Hayduke hikes through. It seems pretty small, but has some beautiful sites. Here are some shots of the morning hike down. There was a side trail that led right up to the Weeping Rock and I was able to get a finish photo. It was a different feeling from the other long trails I’ve finished and didn’t feel as momentous. Maybe it’s because the Hayduke was so short in comparison. 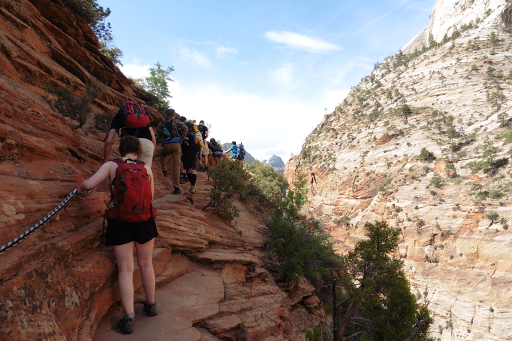 Also, we have chosen to do the bonus ending that adds 38mi and traverses Zion from the Weeping Rock on the southeast, to Lee Pass on the northwest. Still, it was cool to technically finish the Hayduke and have celebratory photo. 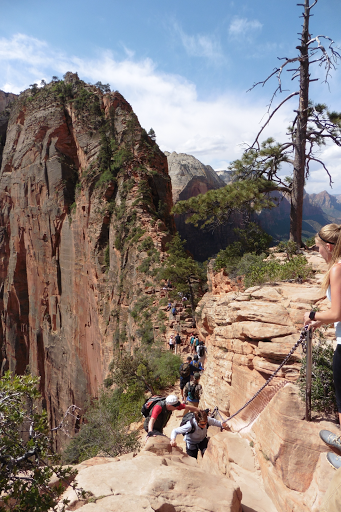 The beginning of the bonus traverse across Zion starts with one of the more popular trails in the park, Angel’s Landing. Looking at it on the map, it is just .4mi up the ridge to the top, but that can be very deceiving if you don’t know more about the hike. That .8mi round trip took us about 1hr 10mins to do an I think we were lucky it wasn’t busier. 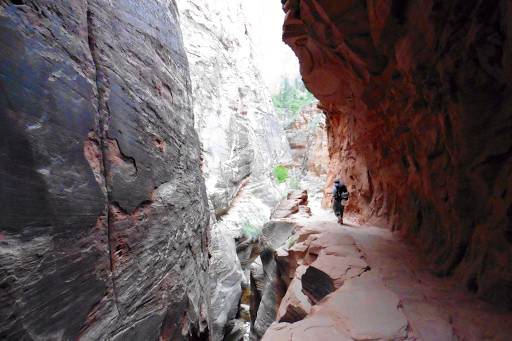 It was really overwhelming to come off out serene morning and walk into such a packed trail. 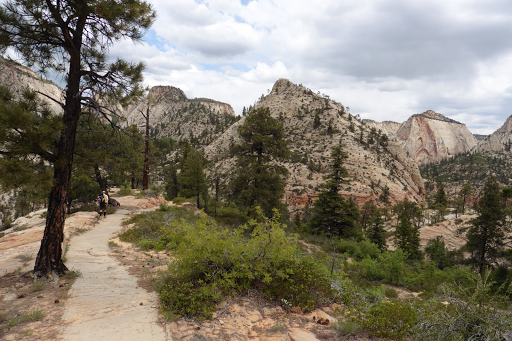 It is similar to Half Dome in Yosemite, in that it has a chain you use to go up and down the steep and exposed trail. Just like Half Dome people going up and down are using the same chain and traffic jams ensue. People were very nice and polite and it that made it more enjoyable. It was pretty much a single file line and we’d proceed in short bursts when there was an opening. It reminded me of when there’s construction and a two lane road is used as one, so there is someone at each end with a stop sign and a line of cars build up before proceeding while the oncoming traffic stops. Again, the coolest part was how organized and polite everyone was. The teacher in me wanted to commend them to reinforce the behavior. It wasn’t the view from the top that I’ll remember, but more the circus to get up there. It goes right up the spine of the rock. 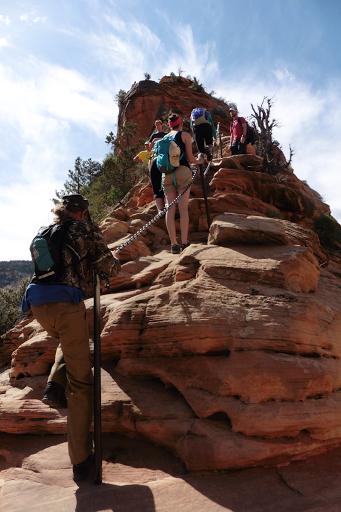 After Angel’s Landing, we got on the West Rim Trail and it was great! 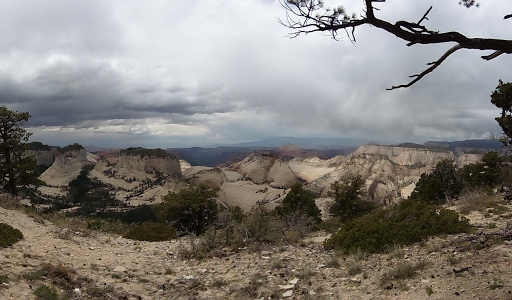 It had quite a climb that gradually went up over 7000ft (we were as low as 4500ft in the morning) to then cruise some miles up high on the rim to take in the views of the park. I really enjoyed it. You can see the clouds were quite ominous. They were all around us for while with sun somehow just on us, but we weren’t fortunate enough to dodge it today. The wind picked up and temps dropped below 50F again. When it started to fall while we were up high, it was sleet for about 10mins. 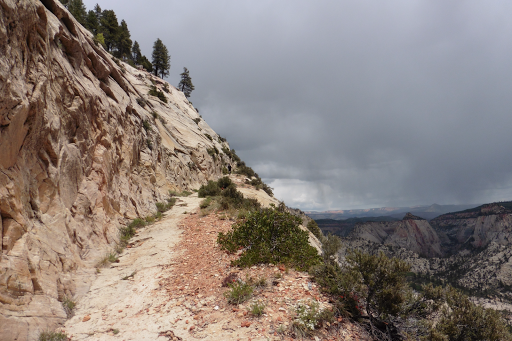 Then we dropped down into Potato Hollow and it turned to rain. It came down steadily for about two hours and the trails became very slick clay mud with puddles gathering in them. 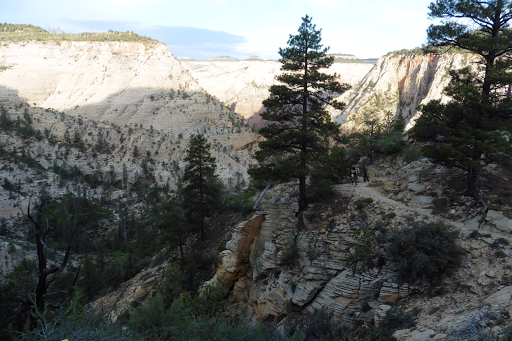 Earlier, on the West Rim Trail, we had wondered why much of that trail was concrete. With how quickly the trial turned into a slip n slide, we understood. We just kept moving to stay warm. I was happy about the timing that we were down low when it hit. Again, the umbrella was golden! It was some really cold rain and it kept my whole upper half mostly dry and warm. 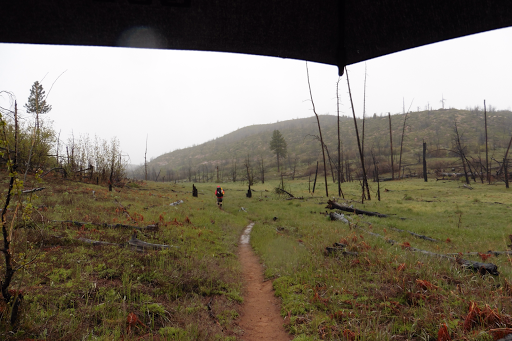 The rain stopped around 5:15pm as we were turning onto the 3mi stretch of trail we had a permit for, the Wildcat Trail. We wanted to get towards the end of it to lower our mileage for our last day tomorrow, so we started hiking down the traverse. Gavin is particular about his campsites and will not pitch in mud. 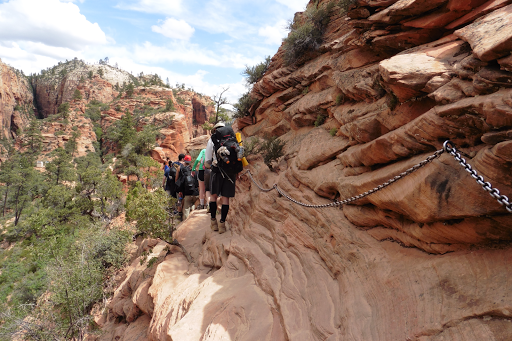 As we headed down, the mud got thicker and was weighing down our shoes. We passed a nice spot that was more gravelly to pitch on and it was killing Gavin. Then a group of four was hiking towards us, so we asked about the camping ahead. They said they were in the same predicament and that they were actually turning around to go to the gravelly site and had left a pack there that we didn’t notice. They said they went down a couple miles and that there was a group that had taken all the spots and that it was really muddy down there. Also, they said they saw nothing doable on the traverse. 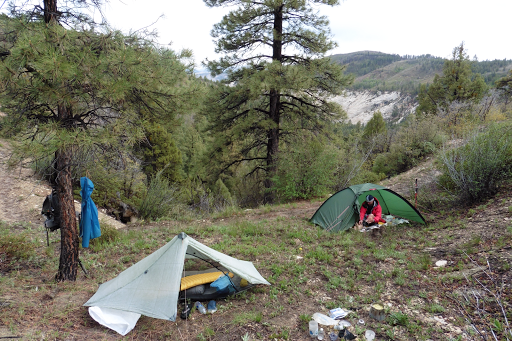 That really got Gavin worried and I agreed to camp at the next spot we saw, which was just 100yds down the trail. We wedged into a drainage area that is actually a perfect fit and setup fortunately before the rain kicked back in. On a side note, those wondering about Katherine, she got an early start this morning, so she was ahead of us all day and will probably finish the traverse tomorrow a couple hours before us.